Well this Bee-fly has been hovering in our garden all week and thought it was strange behaviour for a Bee. 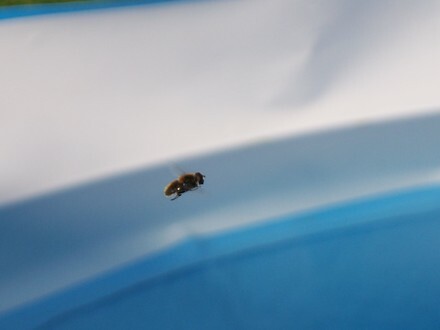 Never known a Bee to just hover in the exact same place, then dart to see of any flies that came in the garden and then return to same place to hover. 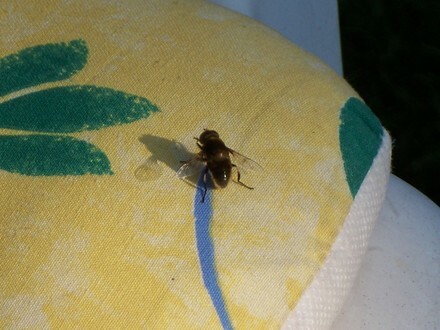 Wasn’t bothered with honey & bumble bees that came in the garden or the presence of us, just the flies. Trying to get a picture was a nightmare as it was so small, soon as you zoomed in the camera really struggled to focus. Soon as you got close it would dart off so that wasn’t an option either. So I positioned myself so that it was in picture against the white wall of the paddling pool and got a picture that was the best i’d got. Then just as I was about to come in to upload the pic, it done what it hadn’t done all week….Landed on the chair cushion. So zoomed in quickly and snapped the little bugger!! Spent the best part of a hour trying to get pics and getting info that i’d run out of time to do another hanging basket. Well there’s always tomorrow. Next post: Hornets stops play!! Could do with a few of these in my backyard Steve. Seem to have millions of flies this year! Got him in the end then steve! Good close up...he's quite a little poser! Is there any point in being a fly that imitates a bee? Must have his uses I guess! Yes he is a poser Fluff and must be a reason they imitate a bee but don't know myself as yet. Will google it tomorrow. Did you see Spain tonight tho'? Even I cheered for their goals! Proper football played like it used to be! Oh yes. Glad Chile went through aswell and can't wait for there game against Brasil. Gonna be a classic me thinks!! I'll forgive ya then. Just been trying to capture a hornet but the thunder storm has sent 'em packing for now...typical when you want a pic!! Yes we had a brief tunder storm and lot of wind but didn't last for more than 10-15 mins. Now just a dull overcast evening.